There was no way to rely on anything we knew before this film. No character was like Stone, no film set was ever like these sets, not one member of this crew had ever done this before. We all were doing something that had never been done before. At that point, I wondered whether the film as a whole could keep up that experimental feeling, with vertiginously wheeling actors combined with an untethered camera swooping around them. Or would the narrative gradually lead us into a more conventional style later in the film? It turns out that, to a remarkable extent, the highly unconventional treatment of unanchored space, where up, down, and sideways characters and background change with a breathless rapidity, extends through much of Gravity‘s length. For brief intervals Ryan enters space capsules and sits, right-side up, and the action calms down briefly. Yet these lead to further scenes in space with the same swooping camera. In short, the film turned out to be as remarkable a formal and stylistic achievement as I had hoped. SPOILER ALERT. This is not a review but an analysis of the film. Gravity does depend crucially upon suspense and surprise, and I would suggest not reading further without having seen the film. I think that to say Gravity has “only barely” more narrative than Snow’s purely abstract film is a considerable exaggeration. The film’s story is certainly simpler and more unconventional than other mainstream Hollywood films, but as we shall see, it contains goals, motifs, character traits, careful setups of upcoming action, and other traits of classical narratives. Depth and volume are illusory. Mass has no weight. 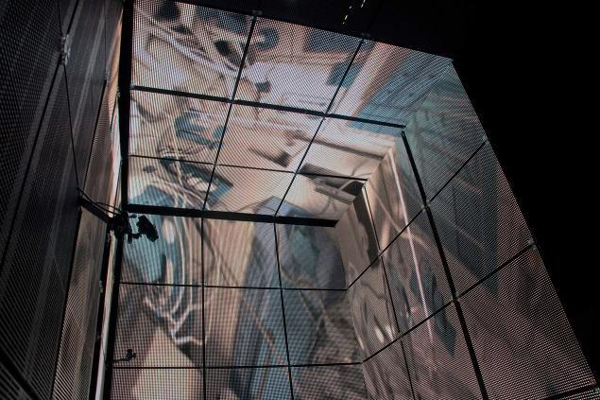 In this 3-D spectacle, best seen on the outsized IMAX screen, Cuarón promotes sensory disorientation–or better, reorientation. […] Gravity is something quite rare–a truly popular big-budget Hollywood movie with a rich aesthetic pay-off. Genuinely experimental, blatantly predicated on the formal possibilities of film, Gravity is a movie in a tradition that includes D. W. Griffith’s Intolerance, Abel Gance’s Napoleon, Leni Riefenstahl’s Olympia, and Alfred Hitchcock’s The Birds, as well as its most obvious precursor, Stanley Kubrick’s 2001. Call it blockbuster modernism. 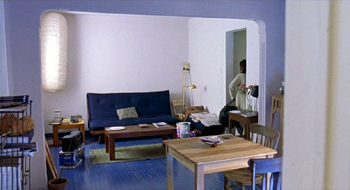 Hoberman sees more of a balance between style and narrative than does Foundas. In fact, he considers that the film contains “a distracting surplus of backstory.” Presumably he would prefer to do without the references to the death of Stone’s daughter and her subsequent aimless car rides after work, listening to the radio. The space voyage does become an overly obvious extension of that drifting and listening, coming close to turning the film into a maternal melodrama. Presumably the filmmakers felt that simply sending Stone on a mission and having her struggle to return to earth was not enough. In interviews, the co-scriptwriters, Alfonso and his son Jonás Cuarón, emphasized that their basic idea was to create a character arc of her “rebirth” after despair. To some, this arc, with its religious overtones, will seem a bit, as Hoberman says, distracting and even contrived. To others it may be inspiring. At least it is not allowed to come forward very often. David and I have often claimed that Hollywood cinema has a certain tolerance for novelty, innovation, and even experiment, but that such departures from convention are usually accompanied by a strong classical story to motivate the strangeness for popular audiences. (This assumption is central to our e-book on Christopher Nolan.) 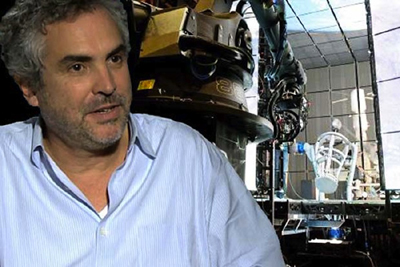 Gravity has such a story, though Cuarón is remarkably successful at minimizing its prominence. The film’s construction privileges excitement, suspense, rapid action, and the universally remarked-upon sense of immersion alongside the character in a situation of disorienting weightlessness and constant change. That construction derives partly from techniques unique to this project. The weightless dance of characters and camera almost entirely does away with such widely applied spatial premises as the axis of action, eyeline directions, and the establishing of stable spatial relationships. And, as Cuarón pointed out in an interview for Wired, “After all, you learn how to draw based on two main elements: horizons and weight.” Those two factors are virtually gone as well. The weightlessness and the long takes in the film have been given much attention in the press. Reports refer less often to the “Light Box, one of the film’s most extraordinary innovations. 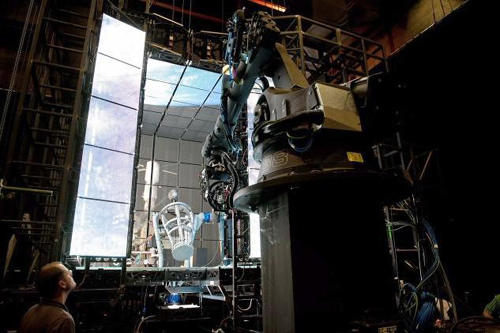 It is a giant inside-out LED monitor that allows the film’s own previs special effects to light the faces and bodies of the actors inside the box, making it possible for those shots to be integrated seamless into the effects shots. Basically, apart from the scenes inside space vehicles, traditional three-point lighting is jettisoned along with spatial relations. Other technical aspects of the film are innovative. A bold new camera mount, the Isis, was devised to allow the camera to twist and whirl around the actors. The silence of space was respected by the filmmaker, leading them to substitute a eerie musical score to replace sound effects and convey emotions. The blocking and acting, of course, had to be vastly different from methods used in conventional films where the actors have the luxury of walking on a ground plane. In short, it is hard to think of another mass-audience film in recent years that has so thoroughly departed from the current technological and stylistic conventions of mainstream filmmaking. Jurassic Park and The Lord of the Rings, to be sure; perhaps Avatar. Publications devoted to the techniques of cinema have recognized this. The Cinefex issue dealing with Gravity is not yet out, but on the journal’s blog, Don Shay’s remark is quoted: “Every once in a while, a film comes along that is a game-changer. This is one of those films.” Debra Kaufman, writing about the film’s 3D for Creative Cow, agrees: “Anyone who’s seen Gravity 3D will agree that the 3D was a game changer.” And unlike those earlier game-changers, Gravity has a strong experimental component to it that audiences gladly accept, since it is so well motivated by the story and situation. In the next blog entry, I’ll survey the innovative aspects of Gravity‘s style and technique. Today, though, I’ll concentrate on the plot–in some ways conventional and in some ways quite strange–that holds it all together. Who needs psychological depth in a crisis? Arguably Cuarón had constructed nearly the most sparse narrative that can sustain the experimental style and motivate that style enough to hold the attention of a popular audience. Three characters, then two, then one, all with minimal backstories and simple goals. Most Hollywood films have two parallel plotlines, usually one involving a romance. Here there is only one, and it primarily concerns an immediate situation, a cycle of deadly threats alternating with stages of Ryan’s progress toward safety. On balance, the focus is more on the suspense and terror of the situation than on the characters. Although there is a little mild flirtation between Stone and Kowalski, it’s more to generate humor and defuse the tension than to suggest any real possibility of mutual attraction. One indication of the film’s minimal characterization is that fact that we never learn the nature of Stone’s experiment. That would be a logical initial goal for her character. Why has she set herself this particular task, which obviously involved not only scientific expertise in a complex field but also elaborate training to become an astronaut? Where does she work? What might her test achieve? Some reviews have referred to her as a medical expert. As far as I can tell, this is based on one line when she and Kowalski are working together to activate the communications device that is her focus of attention in the opening scene. During the calm before the debris collision, she remarks, “I’m used to a basement lab in a hospital where trays fall to the floor.” She also says that “It’s designed for hospital use.” That’s it. Normally a Hollywood film would redundantly give us information about her job. Here we don’t even get a sketch of it. And why is a medical experiment attached to the Hubble Space Telescope? Incidentally, the Hubble is detached from the shuttle just before the debris cluster reaches it. 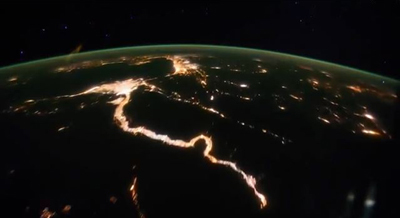 We never learn whether it, too, is destroyed in the disaster. Might it have survived, with Stone’s experiment, perhaps activated during her brief delay before obeying the mission-abort command? Might she return to earth to find her experiment a success, with her initial goal miraculously achieved despite the tragic events in space. So little is the narrative concerned with the experiment as a significant goal that such questions are unlikely to occur to a spectator. They came to me only after three viewings. Stone’s casual reference to working in a hospital lab typifies the limited sort of backstory we’ll get for the most part. Aside from Stone’s recollections of her daughter’s death and her aimless evenings of driving as her form of mourning, the moments of backstory are mere hints. In the opening we learn that Matt’s wife left him when he was in space on a mission. Might he be so obsessed with the beauties of space travel because he, too, is seeking to escape loneliness? We can’t know, since he treats the mention humorously, as if he has managed to shrug off his wife’s betrayal. Of the third character present on the spacewalk, Shariff, we learn that he has a wife and son, something revealed by a photo only after his death. This knowledge serves less to characterize him than to contrast this cheerful fellow with the wifeless Kowalski and childless, unattached Stone. Stone’s mention of her home in Lake Zurich, Illinois and of her daughter’s death is the last piece of backstory that we get, and it comes slightly under half an hour into the film, during the calm interlude when she and Kowalski are slowly traveling toward the International Space Station (ISS). After this, I believe the only scrap of information from her past that we get is that Stone’s daughter had worried about a lost red shoe. And that’s not all. Part of the emotional journey of “Gravity” rests on Stone’s backstory, which includes a daughter she lost, but this is all effectively communicated without breaking the single location concept. 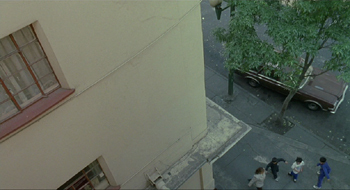 However, Cuarón was advised to perhaps include some flashbacks in the film and even more. “A whole thing with … a romantic relationship with the Mission Control Commander, who is in love with her. All that kind of stuff. What else? To finish with a whole rescue helicopter, that would come and rescue her. Stuff like that,” he explained of some of the ideas that were floated his way. There’s that conventional second romantic plotline, which in the wake of the film’s success seems such a ludicrous suggestion. The studio’s attitude demonstrates how very much Cuarón was able to get away with and how much of a struggle it must have been. Audience and critical enthusiasm suggests that he and his team managed to include just enough classical storytelling to make spectators identify with the characters even while knowing very little about them. Why would a film need to establish psychological depth for characters when most of what they’re going to be doing is struggling frantically for their lives, cast adrift in space and bombarded by hurtling space debris? They must summon what skills and psychological strength they have and get on with it. Thoughtful conversations and subtle complexities are irrelevant for the most part. We need to care about these people to be engaged by the film, but that is part of the point of having Sandra Bullock and George Clooney as the leads, playing to the likeable personal qualities that we already associate with these stars. There’s no question that the characters do have goals, but these are largely based on circumstances thrust upon them rather than on character traits. Before disaster strikes, the characters have short-term goals: Stone to solve the glitch with her equipment (and to avoid allowing nausea to cut short her attempt) and Kowalski to enjoy his final space walk and ideally break the record for duration of space walks. Both goals are cut short by the news of approaching debris and the mission-abort order. As we’ve seen, whether Stone achieves her original goal concerning her experiment is never revealed, nor are we encouraged to wonder even briefly as to whether the Hubble might carry it away from the destruction of the shuttle. Kowalski achieves his goal of breaking the record, in a sense, as he comments ironically while detached and drifting in space and awaiting his death. His space walk will last forever, but records are hardly intended to include corpses. Once Stone spins off into space, alone, her goal is to re-establish contact with Mission Control and Kowalski. His is to rescue her. Once he finds her and tethers them together, their mutual goal is to get to the shuttle, with Kowalski adding the goal of retrieving Shariff’s body. Very quickly these goals are shattered, since the shuttle has been extensively damaged and its other crew members killed. A new short-term goal arises: reaching the relatively nearby ISS. Kowalski fails to achieve this goal, since the fuel in his jetpack and his inability to grab anything on the ISS’s exterior send him floating off into space. Stone’s goal is now to get inside before she passes out from lack of oxygen. Once inside, her goal is to detach the remaining semi-functional Suyuz landing vehicle and use it to get as far as the Chinese space station, in turn using its landing pod to return to earth. Her purpose, however, seems to be thwarted when the fuel tank of the Soyuz vehicle proves to be empty. Here Stone loses hope, drifting into despair. She decides to turn off the oxygen supply and allow herself to die. Suddenly Kowalski appears and enters the pod, giving her a pep talk and telling her to use the soft-landing function of the Soyuz rather than its take-off capabilities. He disappears, and Stone, reinvigorated and determined, follows the instructions for landing the craft. 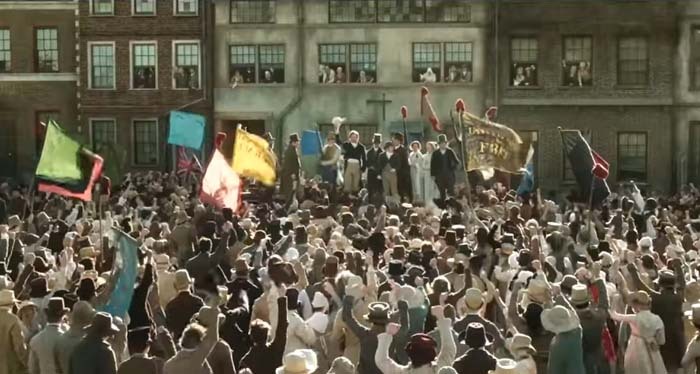 In traditional classical films, shifting goals often mark the turning point between large-scale sections of the plot, generally referred to as acts. Despite its unconventional aspects, Gravity’s plot does stick fairly closely to the well-balanced four-part structure that I have claimed is typical of Hollywood narrative conventions. Not counting titles or credits, the story runs approximately 83 minutes. Thus on average the acts would run about twenty-one minutes each. At about 22 minutes in, Stone and Kowalski achieve their goal by reaching the shuttle, only to discover that it has been destroyed. 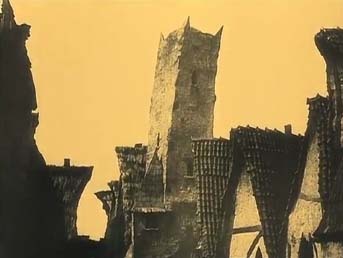 At 23 minutes, Kowalski declares them the last survivors of the mission. I take this to be the first turning point, ending the setup and beginning the complicating action. Essential premises are reversed as the pair realize that they are stranded in space and they shift their goal, striving next to reach the ISS. Stone’s failed attempt to contact Kowalski by radio once she enters the ISS–she initially hopes to rescue him–and declaration of herself as the mission’s sole survivor happens at roughly 43 minutes. 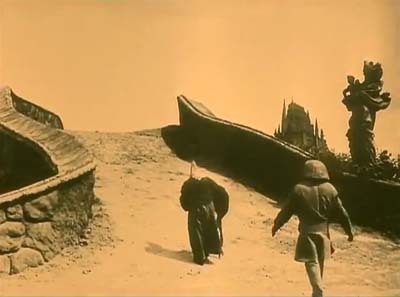 The third act, the development, begins, with Stone meeting numerous obstacles that threaten her new goal of getting back to earth in the Chinese landing vehicle. The last turning point, launching the climax, comes when Stone awakens from her dream about Kowalski and turns the oxygen flow back on, signaling her return to hope and determination to reach earth. That happens at about 66 minutes in, leaving seventeen minutes for her landing, including the brief epilogue of her floating, swimming ashore, and shakily standing up. As I mentioned, strongly innovative films in the Hollywood tradition need the support of classical conventions to keep the narrative clear and appealing. 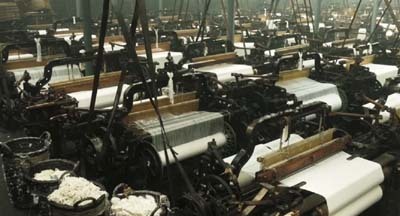 Two of Gravity‘s most traditional techniques are its motifs and its motivations. Motifs can quickly make the characters more vivid, even if they are not particularly rounded or complex. Motivations often involve planting an object or event in advance. 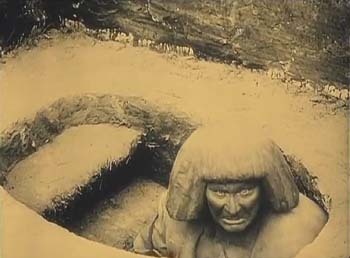 In this film, several motifs trace the relationship between Stone and Kowalski. In the opening, the motif of Kowalski’s wanting to break the space-walking record is introduced early on, stressing that this is his last mission and hinting that he loves his time in space. Similarly, his anecdotes, introduced with the “I’ve got a bad feeling about this mission” running gag, create irony but also suggest how Kowalski inspires Stone. Before setting out on her re-entry flight in the Chinese landing pod, she repeats this line with the same good humor that Kowalski had displayed. Another parallel is set up between the two when Stone detaches the clasp tethering her to the wildly spinning support in the opening scene, and later Kowalski does the same to separate himself from Stone when they are precariously suspended from the ISS (below). She comes back; he doesn’t. 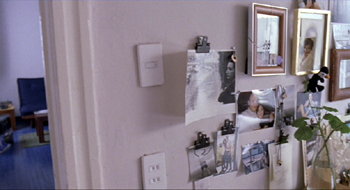 In the early scene where the pair work to activate Stone’s equipment, he refers to her “beautiful blue eyes,” though she points out that hers are brown. Later, when Kowalski has set himself adrift in space, their radio conversation mentions his “beautiful blue eyes,” which are also brown. Though we see nothing of their earlier relationship, such motifs lend it depth, because we sense that the two have already developed a customary way of bantering with each other. Similarly, in the opening scene, Kowalski tells an anecdote about how, during a previous mission, he had imagined his wife looking up into space and thinking about him, when in fact she had run off with another man. Later, as Kowalski moves toward the ISS dragging Stone tethered behind him, he asks her if anyone is looking up and thinking about her. This elicits her most intimate revelation, that she had had a daughter who died in a freak accident. There is also no Mr. Stone waiting at home for her. Thus although the two characters have different personalities, both are escaping loneliness by a retreat to the beauty and peace of space. Finally, there is the last shot, with Stone seen from behind against the sky, covered by light clouds. It reverses the opening, when we were in the opposite position, looking down at the earth from space, with the clouds of a huge hurricane prominently visible. There Stone drifted in space, held in place by a large mechanical arm; here she struggles to regain her sense of balance after prolonged weightlessness and succeeds in walking a few steps, thanks to gravity. During the opening, the messages from Mission Control thoroughly forewarn us of the rapidly approaching hail of space debris. After it passes, Kowalski has Stone set her watch for 90 minutes, since that is when they can expect the same debris to return–as it does at regular intervals to destroy the ISS and the Chinese station. Stone reminds us of this danger when she exits the Soyuz vehicle to detach its parachute, muttering, “Clear skies with a chance of satellite debris.” The presence of the deployed parachute also sets up the moment when the chutes of the Chinese pod deploy as it nears its splashdown in the final sequence. As Stone struggles to get aboard the ISS, Kowalski converses with her via radio. They mention her training with landing vehicles. Her only experience has been with simulators, and in every case she crashed them. Still, as Kowalski points out, she knows something about them–a point which proves vital in the dream scene discussed above, where Stone’s mind summons up a memory about how launching and landing space vehicles are not all that different. Apart from creating a brief scene of suspense, the fire in the ISS introduces the fire extinguisher and demonstrates how, in a situation of weightlessness, the extinguisher propels Stone through space. This prepares us for the crucial scene in which she uses it as Kowalski had used the jetpack, allowing her to reach the Chinese station despite being untethered in space. Throughout the film the cause-effect chain remains fairly straightforward, with one major exception that I’ll get to shortly. But because the characters are reacting to rapidly changing circumstances almost entirely beyond their control, the outcomes are often fortuitous rather than the result of character traits. This is not to say the film uses numerous coincidences. It is not coincidence that Stone manages time and again at the last possible moment to grab a pipe or handle on the outside of a space vehicle. She’s aiming to do that, so she manages it not by coincidence but by luck. Some of the most crucial events in the film are partly a matter of character motivation, but the outcomes of Stone’s and Kowalski’s actions are fortuitous. Stone apologizes to Kowalski for not having immediately obeyed his order to stop trying to repair her equipment and head for the space shuttle. She presumably continued with the rebooting because she is a dedicated researcher, reluctant to abandon her important work even when in physical danger. Yet as it turns out, reaching the space shuttle interior would have been fatal. When Kowalski and Stone do reach the shuttle, they find it split open, its crew dead–just as the pair would be had they retreated inside immediately. Stone’s delay actually saved the pair, though neither character could know this at the time. Less obviously, Kowalski accidentally dooms himself. We see him in the opening minutes, cheerfully circling the shuttle and Hubble, playing music, telling anecdotes, and apparently hoping to stay outside the shuttle long enough to set a record. Presumably he has already accomplished his task in the space walk, or perhaps as the most experienced member of the team, he is watching over the other two. He is also, however, wasting fuel–fuel that he doesn’t realize he may need. Later, when forced to travel through space to rescue Stone and then to make it from the shuttle to the ISS, his tank becomes empty just before they reach it. His inability to maneuver without endangering Stone leads to him detaching his tether and stranding himself in space forever. There are other fortuitous events. Stone is lucky that her Chinese pod lands in a body of water but close enough to shore that she can survive the impact and get onto land easily. It is probably by chance that in entering the Soyuz craft, the weightless fire extinguisher blocks the door and that she pulls it into the craft rather than pushing it out. Later the extinguisher enables her to propel herself to the Chinese station. There are also obstacles fortuitously created, as when Stone discovers that the Soyuz vehicle has no fuel–presumably because its supply tank has been ruptured by flying debris. There may be one major exception to this dependence on accidental causes and effects: the religious motif. This is a strange motif, since it doesn’t become significant to the plot until fairly late. Early in the complicating action, as Kowalski and Stone journey toward the ISS and he asks her about her life on earth, he’s playing a country song, “Angels Are Hard to Find.” It’s playing when Stone mentions her daughter’s death; Kowalski soon turns it off to pay more serious attention to her story. At the time, the song doesn’t seem relevant. About seventy-two minutes in, the religious motif returns and becomes more prominent. Stone discovers that the Soyuz fuel tank is empty. The vehicle drifts as sunset settles on the earth below. We see vast snow fields and fjords below, and frost forms on the window. (The cut to the frosty window is one of the film’s few apparent ellipses.) There is a brief shot of a Russian icon inside the Soyuz (Christ as a child carried by John the Baptist, I think). As she falls asleep, a knock on the door is heard off, and Kowalski enters the Soyuz. He drinks some of the hidden vodka, chats, and tells her to use the soft-landing device. Although he sympathizes with her desire to surrender to the eternal peace of space, he encourages her to save herself rather than giving up: “Ryan, it’s time to go home.” After his disappearance, Stone once again strives to save herself. Finally, back on earth, in the final shot Stone struggles to rise, muttering “Thank you,” before walking away from the camera, which tilts up to a low angle of her against the sky. 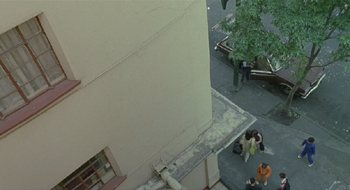 Though this motif appears late in the film, the narrative stresses it. Something is going on here, but what? Most obviously, Stone seems to become somewhat religious, despite never having prayed before. Perhaps this is simply an emotional change that allows her to reconcile somewhat to her daughter’s death, to feel hope and enthusiasm for carrying on with her attempts to reach earth, and to accept her survival as a gift to her from some sort of deity. Given that the startling visit of Kowalski, whom we assume to be dead, to the Soyuz and also his providing Stone with the one bit of information she needs in order to carry on, we might assume that this scene presents a sort of miracle. Kowalski’s visit makes him a quasi-angelic figure bringing divine intervention to Stone, perhaps, or simply a vision inspired by a divine power. Yet his return is cued as a dream, with Stone falling into a sleep that she assumes will end in death. We all have had some sort of experience with a dream providing inspiration or the solution to a nagging problem. As Kowalski points out, Stone should know that taking off and landing are essentially the same thing; it was part of her training. The dream does not give her the knowledge but rather reminds her of it. Indeed, after she wakes up, she still has to struggle to remember what she learned about soft landings and also consults the manual. Seemingly Stone gains some sort of religious belief or spiritual consolation. While working on the Chinese pod’s controls, she talks animatedly to the absent Kowalski, whom she apparently envisions meeting her daughter in an unspecified afterlife. The “Thank you” at the end I take to be the conclusion of this monologue in the pod, thanking Kowalski. In a truly classical film, a character mentioning never having learned to pray would surely say a prayer later in the film. Stone never does. I interpret the religious motif as signaling a transformation of her attitudes rather than implying some sort of divine intervention to rescue her. Either way, some viewers might take this motif to be heavy-handed or saccharine, but its ambiguities could prevent others from having such reactions. The combination of narrative techniques that I have just analyzed obviously appealed to many of the the people who have seen the film. Through four weeks in theaters, Gravity earned $206.1 million, which accounted for just under a third of total domestic box office earnings in October. It’s already the highest-grossing movie ever to be released during the Fall (September or October) and will earn at least another $50 million before the end of its run. Gravity‘s remarkable success can be attributed in part to Warner Bros.’s great marketing campaign, which helped the movie set an October opening weekend record ($55.8 million). From there, the movie had an unprecedented second weekend hold thanks to world-of-mouth that asserted the movie needed to be seen on the biggest screen possible (and preferably in 3D). Speaking of 3D–Gravity‘s box office has been pumped up by the fact that most people (around 80 percent) are choosing to pay an extra few bucks to see the movie in that premium-priced format. Abroad, the film has also done well. As of November 6, its foreign box-office gross is about $207 million, with the film still to open in several major markets, and its domestic take has risen to almost $220 million, expected to top out at $260 million. Some moviegoers (and critics) have found the film boring. But those who love it really love it. Our next entry will deal with the film’s style and how it was achieved. Coincidences can play many roles in a film’s plot, as we discuss in this entry. You could take Gravity’s ambivalent gestures toward Stone’s spiritual redemption as another example of Hollywood’s strategic ambiguity about controversial themes. Jason Mittell has written an essay, “Gravity and the Power of Narrative Limits,” which nicely complements my analysis. 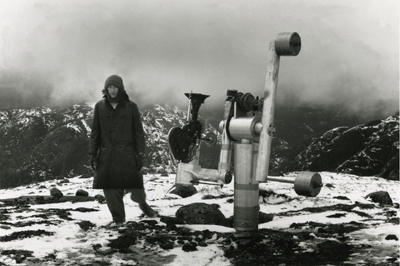 He concentrates on the film’s relation to traditional genres, discussing how it departs from familiar conventions of science-fiction and survival narratives. P. S. 9 November: After I linked to this entry on my Facebook page, Meraj Dhir commented that the song Shariff sings as he does his little weightless dance is from a famous number in Raj Kapoor’s 1955 musical Shree 420. Not exactly relevant to my analysis, but fun to know, so thanks, Meraj! You can see the number here. NOTE: On November 8, after watching the film a fourth time, I revised this post, correcting a few errors and quoting some brief passages of dialogue that I was able to record on this go-through. I have not noted the changes with the usual strike-through lines, since it seemed too complicated and distracting to do so in this case.